What is the first thing you think of eating when you have a cold or flu? Chicken broth, right? The clear, flavorful broth made from fresh chicken and vegetables restores your soul as well as your body. Such is the premise behind the bone broth movement. 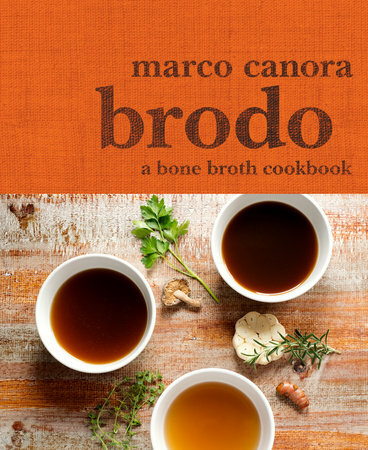 Chef Marco Canora points out the healthful benefits of drinking bone broth in his book Brodo, a Bone Broth Cookbook (affiliate link), published by the Crown Publishing Group. "No longer just a building block for soups and sauces, bone broths are now being embraced for their innumerable health benefits, from cultivating a healthier gut to greater resistance to colds and other illnesses." 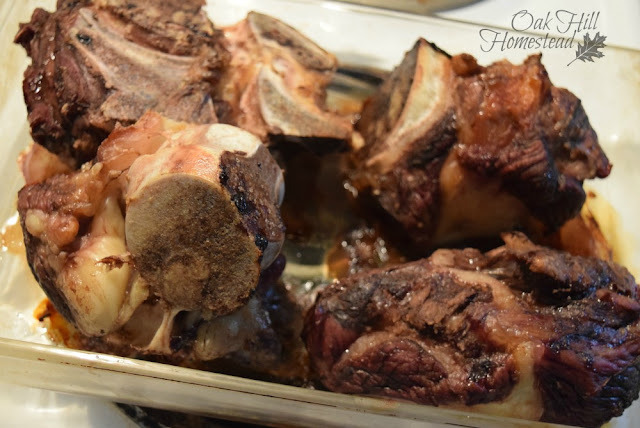 Chef Canora shares directions for many different broths including beef, chicken and his signature "hearth broth" plus delicious add-ins such as roasted garlic puree. He also suggests places to obtain grass-fed bones. His recipes aren't just for bone broths, there are shellfish and seaweed broths and a frugal "end-of-the-month broth", plus suggested ingredients for broth bowls. I've made chicken broth from scratch for my family for many years, and after reading this book I made beef broth from the bones of the grass-fed steer we raised for the freezer. I followed the recipe for Grass-Fed Beef Broth, roasting the bones first, then simmering them with vegetables and herbs. I have home-grown pork in the freezer too and will be trying the pork broth recipe next, which is flavored with apple cider and rosemary. Making bone broth does take several hours, but the actual hands-on time required is minimal. When finished, the broth is strained into jars and cooled in the refrigerator. Any fat solidifies on top and is easily removed with a spoon, leaving a healthy, flavorful broth to sip or to add to soups, stews and other dishes. Brodo, a Bone Broth Cookbook (affiliate link) is a beautiful high-quality book with thick pages and eye-pleasing full color photos. It's an excellent resource for your healthy kitchen. I appreciated Chef Canora's straightforward style, although his language was a bit more down-to-earth than I'm used to reading. If you're interested in learning about the healthy benefits of bone broth and having a collection of delicious broth recipes in one place, I recommend Brodo, a Bone Broth Cookbook. I received this book from the Blogging for Books program in exchange for this review, but the opinions in this post are my own. receive a small commission, but it doesn't affect the price you pay. I recently go through your site. It's really Awesome! Thanks for your blogs! This is a great French Onion Soup recipe Kathi, as you know I made similar a short while ago and it was lovely! Thanks a lot for sharing! You're welcome, Julia. French Onion soup is my favorite! French Onion Soup definitely yummi! I love your recipe cuz it contains healthy ingredients! Thanks a lot for sharing Kathi! Kathi, Thanks for the recipe. Delicious! Kathi, Delicious! I wonder, but a lot of calories? Just be mindful of your additions to the broth, Julia.